Got a problem? Sleep on it. Do you find yourself mulling over problems and reviewing the day’s activities as you try to sleep at night? You’re wasting your time and depriving yourself of sleep. Your brain won’t start working until you’re out of the picture. Once you are asleep, your brain can take over. It never sleeps. That’s why your brain consumes up to 25 percent of the oxygenated glucose and nutrients distributed by your body’s circulatory system – even though it is only 2% of your total body’s weight. It’s a powerhouse – both during the day when you are directing its power, and at night when you’re supposed to be sleeping. At night it repairs and replaces old neurons, decides what’s important to you and what isn’t, and consolidate memories. Oh yes, and in the morning it provides you with fresh insights on those problems that were keeping you awake, and frequently gives you a bonus of a truly creative idea – an “Aha” moment. But you have to let it do its job. You can’t expect it to solve problems at night (when you’re stressed out and tired) that you were unable to solve when you were fully awake and alert. We are programmed to spend about a third of our lives asleep. It’s not wasting time. During sleep those amyloid proteins – plaques and tangles – indicative of Alzheimer’s – are washed away. Sleep keeps us mentally sharp, creative and productive. Don’t feel badly about all you’re fussing at night. We all tend to do it. 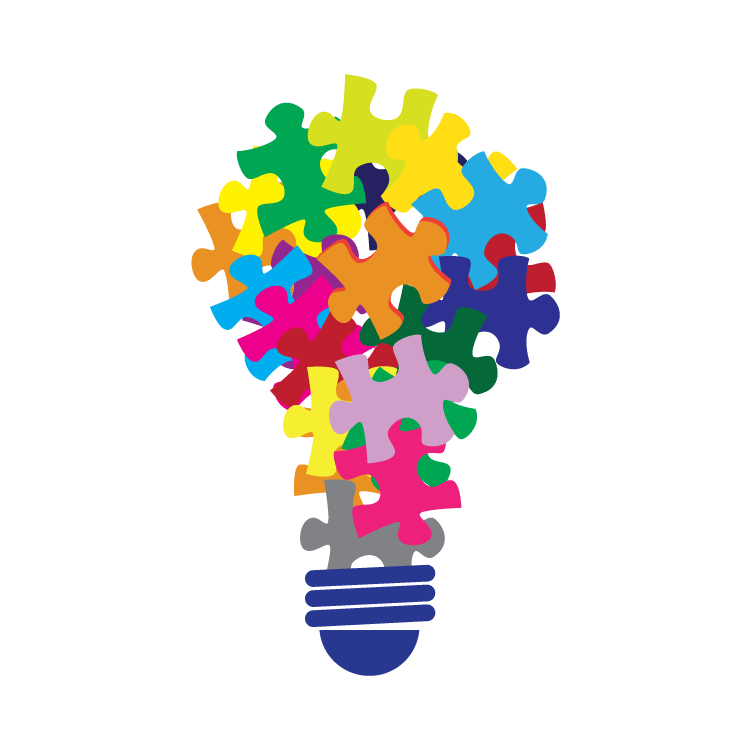 It’s what we call “thinksomnia.” We’re so busy during the day fighting fires, flitting about from one job to another, fielding problems and crises that night-time seems to be the only time there is to really think about a problem and be really creative. But the thinking keeps you awake. And you are anything but creative. Your job is to relax, let go of the day’s problems, and go to sleep. Sleep is as critical to life as the air you breathe. Don’t trade for it for anything – not even that million dollar contract that may be at stake if you flub that presentation in the morning. That part of the brain that you rested will be rejuvenated, in addition to having completed its essential work during the night. You will be mentally alert, creative, optimistic and energetic in the morning. That’s worth more than another night of anxiety mixed with preparation. Believe it. We need between seven and nine hours of sleep to be at our peak. That’s sleep-time, not bed-time. Less than six hours sleep and you are sleep deprived, which means you will not be at your best. Although a sleep deprived brain my tell you the opposite, your thinking skills will be way below average and your personal productivity will plummet. There are ways of freeing up your mind and getting a good night’s sleep – and that’s not by taking sleeping pills. You might want to take a look at my brief e-book, Sleep: a time management strategy, published by Bookboon.com. It contains many suggestions that are based on actual research. Keep the bedroom cool. Scientific evidence indicates that 65°F to 68°F is the ideal temperature for sleep. Skip the caffeine. Avoid coffee or other caffeine drinks at least six hours before bedtime. It can actually stay in your system for 12 hours. Avoid alcohol and cigarettes as well. Stick to a routine. Where possible go to bed and get up at the same time every day, including weekends. It helps regulate the body clock. When people try to catch up on sleep on the weekend the quality of the extended sleep is quite low. If you can’t sleep, don’t stay in bed. Don’t spend too much time trying to sleep; it reduces the sleep drive. Read a book, listen to calming music or engage in relaxation exercises. If thoughts of all the things you have to do or specific worries linger in your mind, write them down on paper so you can put them out of your mind. Don’t fight your biological clock. There is a time to work and a time to sleep. Don’t confuse the two. Being able to manage stress is critical since it can weaken the immune system, raise cholesterol levels, accelerate hardening of the arteries, disrupt the digestive system, and lead to overeating and obesity. And according to Tiffany Chow, in her book, The memory clinic, it can also increase the risk of developing dementia. When you’re under stress, you don’t think clearly. You could find yourself in the state of panic, getting more stressed by the minute. But once you have calmed down and feel in control once again, things go back to normal. The source of our emotions is believed to be the amygdala, two small almond shaped regions of the brain. It’s our “fire alarm” that signals danger both real and perceived. It really can’t tell the difference between a life-threatening emergency or simply the need to get to a meeting before it starts. When you feel stressed, you don’t have to immediately start deep breathing or meditating. You merely have to take control of the situation. This involves looking at the stressful situation objectively and determining how critical it really is. For instance, if you can’t find the agenda you received for the morning’s meeting, is it really going to matter? You could probably share a copy with someone else or even take a quick snapshot of someone else’s copy with your iPhone. Once you know that you can deal with the situation, and you calm down, it’s amazing how often you will then remember where you placed the original agenda in question. That sudden feeling of panic when you can’t remember something or feel unprepared for a presentation or think you may be late for an appointment cannot be prevented. It’s a product of your automatic nervous system, which regulates the release of adrenaline, blood pressure, heart rate, hand temperature and other physiological changes. It’s an automatic response to a perceived danger, real or otherwise. Don’t expect the part of your brain that pushes the panic button to distinguish between a slight concern and a major crisis. That’s not its job. You have to activate another part of the brain located in the prefrontal cortex to take on that task. You have to use your brain’s executive centre in the prefrontal cortex to pay attention to the alarm, think it through clearly, focus on what is really important and take any necessary action. You don’t relieve stress by taking deep breaths and telling yourself to calm down, you have to pay attention to the signal, and take control of the situation. The opposite of stress is not being relaxed calm or half-asleep, it is the feeling of being in control. You’re in control when you feel that you are able to handle whatever life happens to throw at you at the time. There is such a thing as building stress tolerance. That’s one of the brain-based executive skills discussed in my ebook, Strengthen your brain’s executive skills, published by Bookboon.com. Don’t be a slave to your cell phone. According to the Newsweek article referenced above, studies show that taking three or four hours each day away from the Internet and digital communication is not only a healthy distraction, but also a partial antidote to stress. And believe it or not, orderliness seems to help as well. UCLA researchers discovered that the sight of clutter can induce the production of stress hormones. So be sure to organize both your working and living environments. The secret to handling stress is to take charge. You do that with your mind – the real you. Adult coloring books: stress relievers or waste of time? In the United States in 2016, adult coloring book sales topped $14 million compared to $10 million in 2015. Recently, sales have slowed down, possibly because the books have reached the saturation point. But that’s a lot of people who still believe the books are beneficial. Last week there were still over 200 different adult coloring books listed at the Amazon website alone – ranging in price from a few dollars to over $20 each. 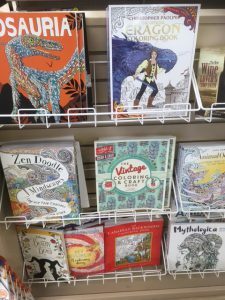 Although using your children’s books may be just as relaxing, adult coloring books sport higher quality paper, more intricate designs, and a wider selection of themes. I snapped the accompanying photo of a magazine section in my local supermarket, showing the extent that adult coloring books are encroaching on valuable rack space. Are people regressing to childhood activities in an attempt to escape work and/or responsibility? Will executive sandboxes be making a comeback soon? Or are people finding it difficult to find an adult hobby? Is it an example of the “cocoon” lifestyle where we avoid interacting with other people? Or can people not find more productive ways to use their time? No, these aren’t the reasons why so many people are taking to coloring within the lines of sketches, designs and geometric shapes. Although adult coloring books are mostly marketed to harried adults looking to relieve stress, they are also claimed to expel negative thoughts, help you achieve mindfulness, distract you from the daily pressures of life, release your creativity and allow you to experience relief by altering your meditative state. There are even reports of lowering blood pressure and reducing heart rates. There is some disagreement over the therapeutic benefit of coloring books, and they are not a replacement for art therapy, meditation, yoga or prayer; but the books have been known to help switch off your brain and elicit a relaxation mindset. So this does make them stress relievers. Focusing on anything, whether it’s a coloring book or not, does consume less energy, and giving the brain’s amygdala a rest has to be a good thing. It’s definitely more difficult to worry or obsess over problems and still color mandala patterns at the same time. And engaging in a childish pastime made accessible and acceptable to adults should be a welcome diversion for many hard-working executives. But isn’t it a waste of time? Not really. 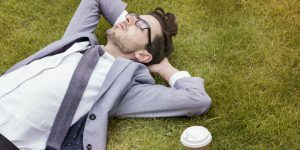 It has already been proven that working in chunks of time, such as 90 minutes, separated by relaxing breaks – or at least a change of pace – aids personal productivity. Perhaps coffee breaks should be replaced by coloring breaks. Or it might at least be a good transitioning activity as you transfer your mind and body from work to home. Coffee breaks are usually not free of interruptions. In fact the amygdala part of our brain is constantly on the lookout for interruptions. Interruptions involve multitasking, which in turn causes stress and consumes more energy. Focusing, on the other hand, consumes less energy and puts the amygdala in an idle mode. I have actually never heard of “color breaks.” But literature on the topic of coloring books includes a mention of their use by students in classrooms. They can more effectively concentrate on the lecture while coloring. But isn’t that multitasking? Not really, since the coloring becomes a habitual, mindless activity that allows greater focus than if the student were fidgeting and unable to stay still. This makes even more sense to me when I realize that the inability to focus is often a symptom of anxiety and stress. And I must apologize to my lady friend who insists on knitting when we are visiting with other people. She is actually increasing her focus on the conversations. I still resent the time it takes to color; and I prefer physical exercise as a way to focus while enhancing cognitive health. But certain neurologists and neuropsychologists have convinced me of its therapeutic properties, and I plan to look into it further. In fact I wonder if the colors used would have an impact – as they do in office design. For instance, as I mentioned in my eBook on the impact of the environment on personal productivity (published by Bookboon.com), blue and green have been found to be the most effective in stimulating personal productivity, and green has also been associated with calm and well-being. Health is even more important than time since without it, time is stripped of much, if not all, of its effectiveness. And there is little doubt of the negative impact of excessive stress on our health and well-being. 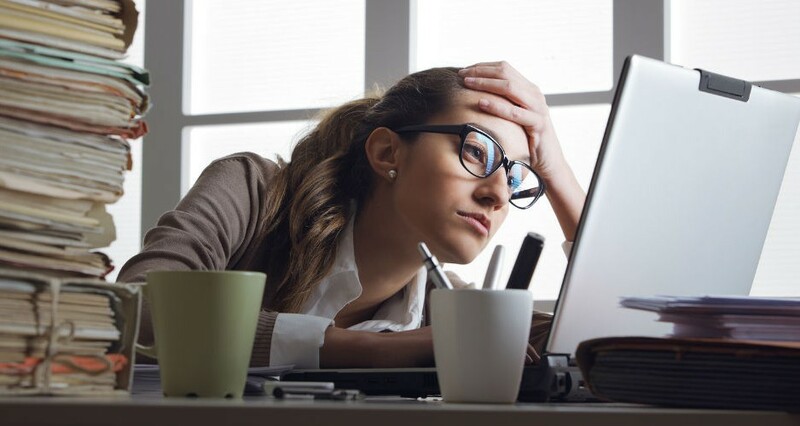 Today there is no shortage of negative stressors – from workload, deadlines and difficult people – to constant interruptions from calls, email and text messages. Few people will disagree that the digital age of speed can be physically, mentally and emotionally draining. Merging high-tech with high touch provides a way of unwinding and recharging so you can replenish depleted energy. Coloring can be viewed as self-care, and a way of maintaining balance in an otherwise go-go-go environment. You have no doubt heard the expression, “All work and no play makes Jack a dull boy.” Well, perhaps adding some bright colors to the situation might prevent that from happening. According to one study, a 17-minute break every hour is ideal; but most of us spend most of the day setting at a desk squinting at a computer screen, putting both our productivity and health at risk. People who take breaks in the morning feel more refreshed and less emotionally exhausted than those only taking breaks in the afternoon. This could be a result of using up more energy on priority tasks and facing more challenges, interruptions and communications in the morning. The more you focus and the more decisions you make, the more important it is to take a break. You also tend to be more creative after taking a break – especially when combining it with exercise. It is thought that your mind it could be chewing away at the problem in the background, according to an item in Time’s 2017 special edition on Mindfulness. When you take a break with other office workers, keep the conversation unrelated to work in order to get the full productivity and wellness benefits. 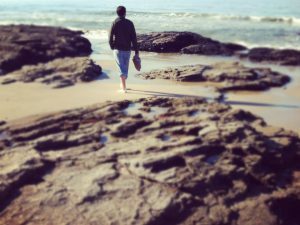 Ideally, physically getting away from work during your break is better than a trip to the company cafeteria or boardroom. A minimum walk of 10 minutes is best – especially if it relates to nature in some way – such as a stroll among trees or in a field or garden. The longer you walk, the greater the benefit, and it has been shown that a 40 minute walk in a forest results in lower levels of the stress hormone cortisol then an equivalent walk in the laboratory. If it is impossible to leave your workstation, at least have a stand-up break. Simply standing increases your energy, and walking increases energy levels by more than 200%. Sitting for more than half the day doubles the risk of diabetes and cardiovascular problems. According to James Levine, co-director of Obesity Solutions, a program of the Mayo Clinic in Scottsdale, Arizona, research indicated that those sitting for over four hours a day had a 46% increase in deaths from any cause than those sitting less than two hours a day. Standing up while working can improve performance. Studies have shown that people can make quicker decisions and absorb information faster when standing. (One study referred to in the August 27, 2016 issue of the Toronto Star mentioned that standing desks in schools improves behaviour and helps kids burn off more calories.) Standing desks in call centres have been known to boost productivity up to 46%. Exercise breaks are probably the most effective, but the most difficult to work into a busy day. So at least walk around when you talk on the phone, stretch, hold stand-up meetings, use standing desks periodically, and take the stairs instead of the elevator when possible. And forget about trying to impress the boss by working through breaks and working overtime. At least one study showed that as long as your work gets done, working longer hours doesn’t make you a better worker in the eyes of your boss. Another study revealed that if people think they should be reachable after work, they feel less in control – and more stressed. How often you take a break is important, and you should take a brief break every one hour and 90 minutes, depending on your energy cycle. Our brain tends to function in rhythms of high energy followed by briefer periods of low energy. This energy cycle is discussed in more detail in my ebook, Managing your energy, published by Bookboon.com. Did you take a break today? Reading this article doesn’t count – because it relates to work. Emotional well-being is when a person consistently reports more positive than negative feelings. And according to research reported in the November/December, 2015 issue of Scientific American Mind, we become more positive and happier the older we get. In spite of hardships and failing health, something about old age keeps people in good spirits – particularly those passing the 100 mark. It could be from failing minds, but more likely this positive attitude is from a changing outlook as we grow older and wiser and more able to control our brains. Certainly studies suggest that the positivity and happiness changes over time and is not something that we always possessed or acquired suddenly as we aged. Also, it was found that seniors who are the most positive also have the sharpest minds – so if you’re young, keep it healthy with both physical and mental exercise. And if you’re old, do likewise. Everyone, regardless of age, should give their positivity a boost whenever possible. A positive attitude tends to stress-proof your life. It’s important to get sufficient sleep, daily exercise and social support. And it’s equally important to be aware of the good things that happen to you – those positives amid negative events. Be more conscious of the things that go right in your life, and remember that when things look bleak, humor helps. Also, volunteer on a regular basis; by helping others you are also helping yourself. Use the “stop” method whenever you find yourself having negative thoughts about a future event that may or may not happen. Negativity thinking is more common than you may think. Robert Leahy in his book, The Worry Cure, (Harmony, 2005) claims that 38% of people say they worry every day, and more than 19 million Americans are chronic worriers. Instead of dwelling on negative thoughts, immediately say “Stop that!” either aloud or silently to yourself. And then get on with the next item on your “To Do” list. Action will dissipate worry every time. You will become more positive and happier the older you get. But why wait when you can enjoy life more right now by accentuating the positive and doing everything you can to eliminate the negative. If that last line is familiar to you, and the research showing that positivity increases with age is accurate, you are already more positive than most people because it’s based on a song written over 70 years ago. Time management experts for the last 100 years or so have been using the analogy of a woodsman chopping down trees who worked harder and harder to get more work done in a day. In competition with another woodsman who consistently outperformed him, even though the stranger didn’t seem to work as hard or as fast, he finally asked how he did it. Normally that has been referred to as pausing for routine maintenance – oiling your equipment, keeping your machines in good working order as well as pausing for rest and renewal, and taking your regular breaks and periodic vacations. It is this latter reference that is becoming more and more critical in this digital age of speed. We have unlimited things to do, a plethora of choices, and unending supply of information – to the point that not only do we not get sufficient rest, we endanger our health and well-being by getting less sleep, inadequate exercise, improper diet and fewer personal relationships. For example, the average person today gets 90 minutes less sleep than a person 100 years ago. A sedentary lifestyle and obesity are becoming the norm. People are frequently skipping breakfast eating on the run. And according to one survey, the most frequently quoted number of really close friends with whom people felt they could discuss important personal matters dropped from three in 1985 to zero in 2004. We must sharpen the saw. The saw refers to you and to me. We must increase our sleep time, exercise our body and our brain, make regular breaks a daily habit, build more personal relationships, and take all of our vacation time. This all consumes time. But the net result will not diminish our productivity. To the contrary, it will increase our personal productivity by increasing the energy at our disposal, making us more mentally alert and creative, providing us with more stamina, and improving our health and well-being – even to the point of prolonging our lives. Although The Popcorn Report is a book about trends and the marketing opportunities arising from these trends, it also provides a glimpse of the time-obsessed world in which we live. Technology brings us facts faster than we can handle them. Texting seems to have become a national pastime. We email or text our messages and letters and seldom have to visit a post office, We shop online, have groceries delivered, scan and email contracts, invoices, and proposals, send electronic greeting cards, and order take-out from our laptops or smartphones. We don’t even have to visit people; we now have social media such as Facebook and Twitter, and can even save time on relationships. The amount of available information is now doubling every few years. By 1987 the microwave oven had already topped the dishwasher as the most commonly owned kitchen appliance. By 1989 people were spending $900 million dollars in the U. S. on microwaveable foods. Faith Popcorn suggests that speed-eating has been elevated to a fine art. About half of the 86% of Americans who eat dinners at home during the week are eating pre-packaged or take-out food that they pick up or have delivered. A new trend is continuing to develop. Originally described by Faith Popcorn in her book, The Popcorn Report (Doubleday, 1991) as the “wandering cocoon”, the trend involves making our cocoons mobile. So when we do get out of our home cocoons, we can live and work in our cars. Thus we are decking our cars with iPods, plug-in TV’s, a GPS, and literally having our meals on wheels. Cars are being made more “livable” and drive time becomes a protected escape. There’s even talk of a microwave in the glove compartment and dashboards that serve as tables to eat from. Some people use their cars as offices on wheels. How ironic if cocooning is an attempt to escape the stress of a fast¬ paced world, and yet finds itself invaded by smartphones, texting, electronic mail and electronic faxes. And as personal one-on-one relationship time decreases, stress increases. Let’s not relinquish that final bastion of peace and tranquility of a home life and friends. It may mean sacrificing the efficiency of working in transit for the sanity of quiet reflection or trading a pizza ¬on-the-run for an old-fashioned home-cooked meal or playing cards with our kids at the kitchen table. It might even require that we turn off our cell phone while we visit a friend or, heaven forbid, actually leave our handheld device at home the odd time. Whatever it takes to regain balance in our lives is a small price to pay for the concomitant rewards: self-renewal, creativity, wellness, and the opportunity to touch base with ourselves. T he more things in your life that you think should be done but leave undone, the more anxiety and stress you experience. Seldom would a person think of a project they had completed or a meeting they had attended or a phone call they had made and feel stressed as a result. The opposite is true. They would feel good about themselves for having completed those things. Unfortunately that feeling doesn’t last when they think of the dozens or hundreds of things that they have yet to do. According to the statement made in a Fast Company article, it’s no wonder people are stressed. “The typical businessperson experiences 170 interactions per day (phone calls, hallway conversations, e-mails) and has a backlog of 200 to 300 hours of uncompleted work.” It’s doubtful the average backlog has reduced any during the last 15 years. If you don’t think something should be done and therefore don’t do it, you’re usually not under stress as a result. If you simply don’t care whether something gets done or not, you’re not under stress either. I’ve never seen a child have an anxiety attack because they hadn’t cleaned their room yet. The first thing we should do is to write them all down. When items are reduced to writing we don’t think of them so often. They no longer pop into our minds unexpectedly, causing incessant anxiety. And even If we are going to be anxious about them, we might as well be anxious about them all at the same time. The next step is to decide which ones can be eliminated without having a significant effect on our business results or our career or personal or family well-being. Most people have a multitude of things drifting in and out of their minds that they feel should be done. Capture them and delete them before they delete you. Of the remaining items, quickly do those that will take less than five minutes to complete. This does not follow the recommended time management principle of doing the most important things first, but it will sure make you feel good to see all those crossed-off items. It’s the greatest antidote for this type of anxiety that I know. Finally, put the remaining items on weekly To Do lists, either in a week-at-one-glance paper planner, your software planner or a handheld computer. Be realistic. Don’t cram them all onto a “Things To Do Today” list. Spread them over the ensuing weeks. If they don’t all get done, it’s no big deal. You have already blocked out the time to work on the ones that are really important. If, after all this, some things still don’t get done, rest assured it’s not your fault. Your job is to do what’s possible, not what’s impossible. If you learn how to stop worrying, you will brighten your days, reduce stress and anxiety, increase your personal productivity, and improve your relationships with others. By worry, I mean having negative thoughts about a future event that may or may not happen. This negativity is more common than you may think. Robert Leahy in his book, The Worry Cure, (Harmony, 2005) claims that 38% of people say they worry every day, and more than 19 million Americans are chronic worriers. Researchers find that worriers show an increased activity in the area of the brain associated with executive functions such as planning, reasoning and impulse control. Strengthening your executive skills, outlined in my brief book, A brains-eye view of time management, (as well as in previous blog articles) will help you control your tendency to think negatively. Trying to put a negative thought out of your mind only tends to make it hang on that much longer. It’s like trying to ignore a song that replays repeatedly in your mind. It makes more sense to spend a few minutes accepting the fact that you are worried, mulling it over, assuring yourself that you would be able to survive even if the worst were to happen, and then get on with the next item on your “To Do” list.